When I was a kid I liked the Avengers comics. From a young un’s point of view you can buy a comic with Spider-Man in it, one with Batman in it, or you can cheat and get one comic that has loads of superheroes in it. 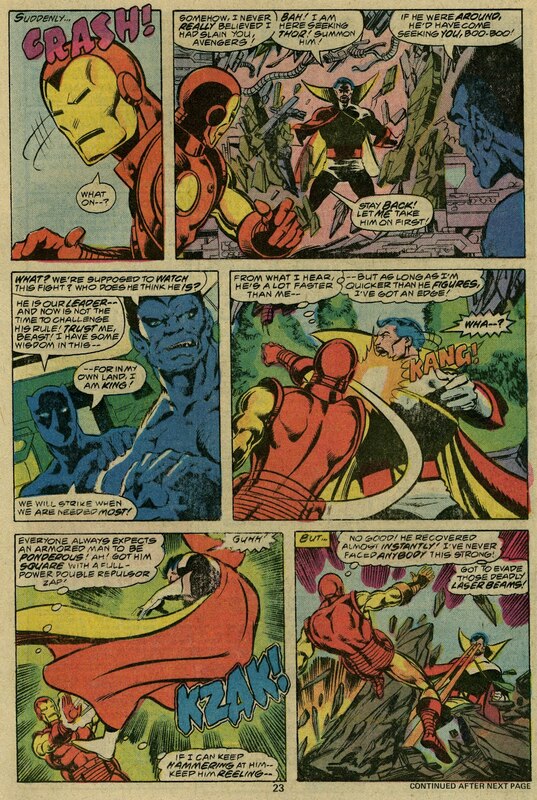 If one character in a comic was great and getting more was a bonus, the Jim Shooter/Dave Michelinie era was like getting away with murder. 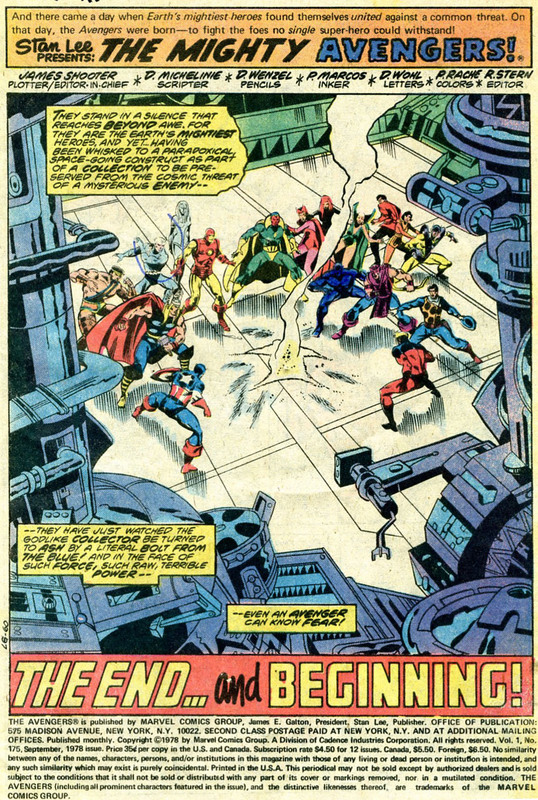 Look at the opening page to “The End…and Beginning!”. Later on in the same story they had a sequence featuring a man and a woman in a sensual embrace. It seemed very risqué at the time. 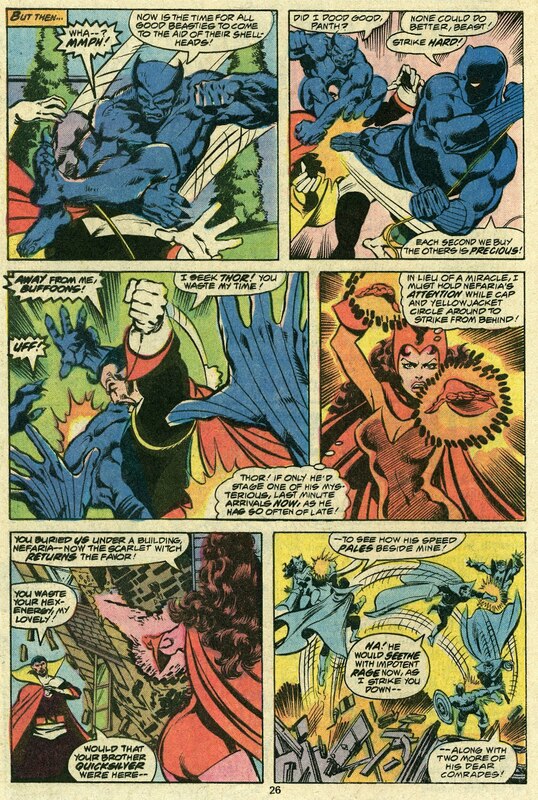 There was a great one by 70s superstar artist John Byrne where Count Nefaria became all powerful and was able to defeat the Avengers easily. They all tried to stop him to no avail. 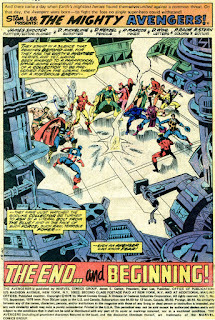 There is tension throughout the story while everyone wonders where Thor is, as surely he could defeat him? 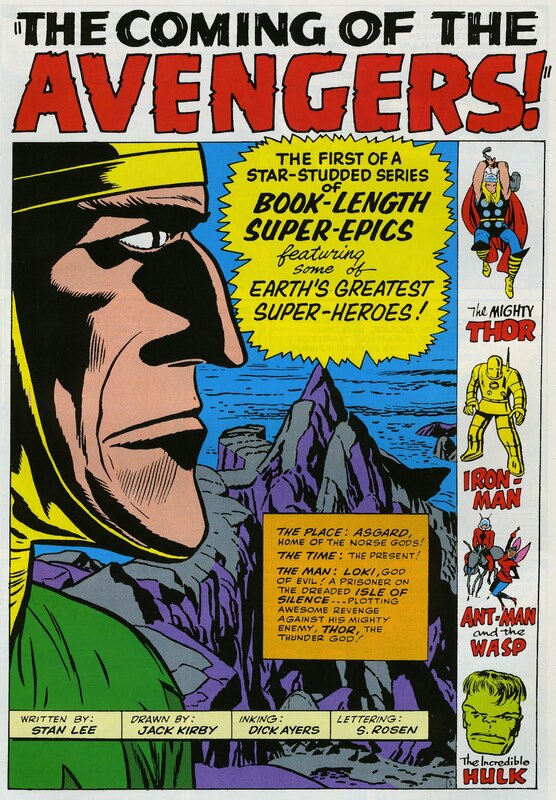 So imagine my excitement back then when I saw that they were going to be showing a TV programme of the Avengers! Unbelievable! And imagine my disgust at some bloke in a bowler hat and a woman sticking a flower in his lapel. 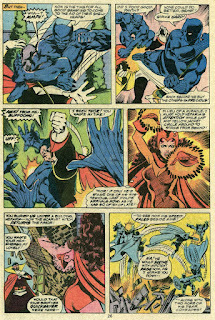 OK, she did shoot his champagne bottle, but that was hardly in the league of tackling intergalactic menace Korvac! Kirby and Joe Simon. 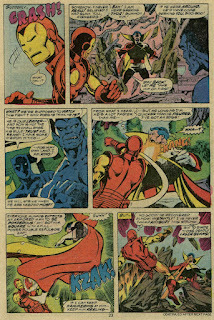 Iron Man is credited to Lee, Don Heck and Larry Leiber as well as Kirby. Here’s a very nice written piece by Neal Kirby on watching his Dad working at the drawing board as a kid. I had a visit to the Science Museum in London last week. Very interesting place to see, but then what a bonus: a Frank Hampson wall! Four original pages of Dan Dare. They were all fantastic. And then later on, more: an Enki Bilal wall. Eight pages from La Femme Piege. In the space exploration area, they have a display based on Amazing Stories magazine. They currently have an exhibition with artwork by Suzanne Treister called Hexen 2.0. I can see it making a good underground comic. The shop had a couple of nice comic books; Robot City by Paul Collicutt and Robot by Andrzej Klimowski and Danusia Schejbal. There was even a display on a book called The 1950s Kitchen by Kathryn Perry that was open at a page with this four panel strip. Always interesting to see comics used in advertising. So go along to check all this stuff out. Even without the comic bonuses, it’s a great museum. Just look at the layout of Making the Modern World hall. Really impressive.